Lab created opal and sugilite bridal ring set featuring an amethyst center set in sterling silver. Each side of this handmade engagement ring is inlaid with 2 pieces of purple sugilite and 1 piece of lab grown opal. The lab created opal is a bright multicolor pattern firing reds, blues and greens from all angles. The center gemstone is a princess cut purple amethyst. The amethyst weighs .65 carats and is securely held in the mounting by 4 corner prongs. The engagement ring measures 7.5mm wide at the top and tapers to 4.5mm at the bottom. This ring would make a great wedding or engagement ring for someone looking for a unique alternative to a traditional diamond. 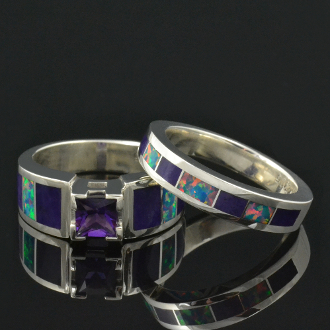 The matching wedding band (style W134) also features sugilite and lab created opal. The wedding band measures 4.5mm wide with a very slight taper to the bottom. The engagement/wedding ring bridal set is shown in a size 6 1/4 for scale but will be made to order in your ring size in 4 to 6 weeks. This bridal set is also available with other inlay materials and other center stone choices. Contact me with special requests or for more details and price quotes. Laboratory grown opal is a great alternative to natural Australian opal. It is basically the same chemical structure except the small amount of water that is present in natural opal is replaced with resin in the lab created opal. This gives the lab grown opal the advantage of greater strength and durability. The colors of the synthetic opal we use rival those of top Australian opal at much more affordable prices.